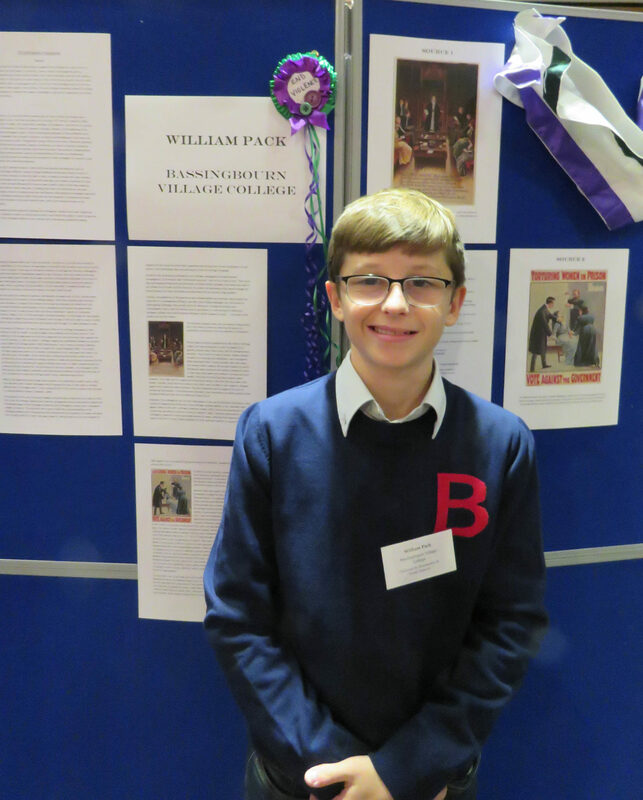 Year 10 student William Pack has been praised for his work on women’s suffrage as part of a competition run by a Cambridge college. William was one of a small group of BVC students chosen to attend the inaugural Millicent Fawcett Humanities & Social Sciences workshop hosted by Newnham College, Cambridge, during the summer. The workshop explored suffrage through a range of humanities and social sciences subjects, and gave students the opportunity to practice researching, writing and presenting their own project. Following the workshop, students were invited to create their own research project based on the theme(s) they found most interesting. Students were then invited to attend a Project Exhibition showcasing all entries which took place last Friday in Newnham College. 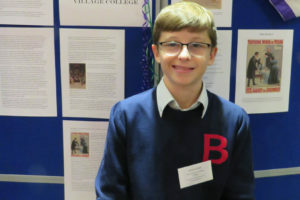 William’s project – an in-depth essay looking at the illustrated propaganda used by the suffragettes, such as postcards, banners and posters – earned him a Highly Commended award plus a runner’s-up prize of book tokens and a signed book by Newnham Fellow and classicist Mary Beard. Organiser Sophie Parry said: “We designed the Millicent Fawcett workshop not only to commemorate Vote 100, but also with the aim of introducing young people to the interdisciplinary world of the Arts, Humanities and Social Sciences. “As a college, we think it is incredibly important to work closely with pupils and schools in our local community, and it is amazing to see the outstanding levels of hard work and creativity that can come from this work. William is photographed above with (from left to right) Dr Janine Maegraith (Director of Studies in History), Dr Sam Lucy (Admissions Tutor), Dr Jenny Mander (Director of Studies in Modern and Medieval Languages) and Sophie Parry, Schools Liaison & Outreach Officer.